Named after Trinity County gold mines, all the rooms have private showers, air conditioners, heaters, ceiling fans, hair dryers, and coffee makers. A microwave and a refrigerator with a limited amount of ice are available in the store-room across from Room 2. A telephone is available for our guests in the telephone booth at the top of the stairs. Sorry, no televisions except in Room 1, (and downstairs in the small lounge behind the parlor.) No smoking inside the building, but there are several swings and comfortable rocking chairs along the side of the hotel where guests are welcome to smoke if they wish. This is a pleasant place to sit on a summer evening, even if you don't smoke. You might be joined by our very shy elderly black and white cat, Cookie. Rates are lower during the week than on week-ends, quite a bit lower in the winter time than during the summer. Room 1 "LaGrange" is our largest room and the only one with a T.V. and kitchenette. It has a queen sized four-poster bed, a full sized sleeper sofa, a full sized gas log fireplace, and a claw-footed "champagne" tub". This room has a view of Main Street from the front and a view of my kitchen garden from the back. Brian and I slept here during renovation when the room still consisted of 2 rooms, 2 walk-in closets and a long hallway. It was a light and pleasant place to live. Price range - $175-$295/night double occupancy. 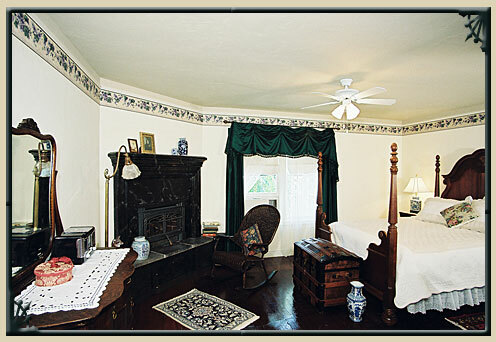 Room 2 "Trinity Lily" has a wicker love seat and matching chair in front of the gas log fireplace. It also has a queen sized four-poster, one of the original claw-footed tubs called a "half tub," and a nice view of both Main Street and the band stand and courthouse. A few people are bothered by traffic sounds on Main Street, but most agree it is a light, airy, and pleasant room. Price range - $145-$220/night double occupancy. Room 3 "Bully Choop" is our honeymoon suite. The walls are covered with old wedding photos, and the sofa in front of the fireplace is a pleasant place to sit with your special someone. 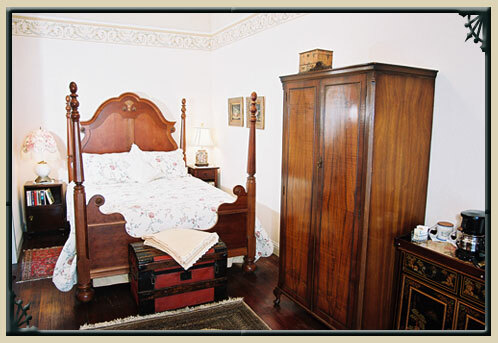 This room has a queen sized four-poster bed, a claw footed "champagne tub" and four windows with a view of the band stand with its small park and Hawthorne tree. It is the second largest of our rooms, and is my favorite. Room 4 "Corona de Oro" has a little window seat that I love. It looks out over the band stand and its Hawthorne Tree. I like to sit in this comfortable window seat and read what guests have written in the room journal, and was doing so one day when a gorgeous male Ana's Hummingbird perched on a nearby twig, preening himself completely oblivious to my presence. 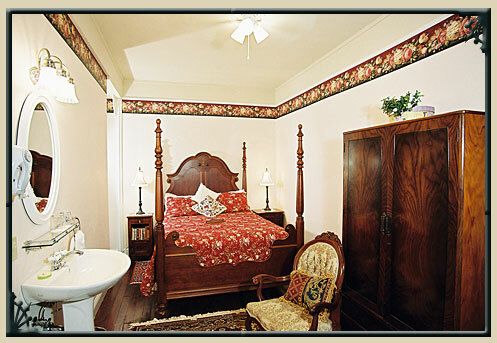 This room is furnished with a queen sized four-poster bed, a gas log fireplace, claw footed "champagne tub" and a comfortable chair for reading, making it our very best value. Room 5 "Brown Bear" has one of the original soaking tubs in the sunny bathroom. 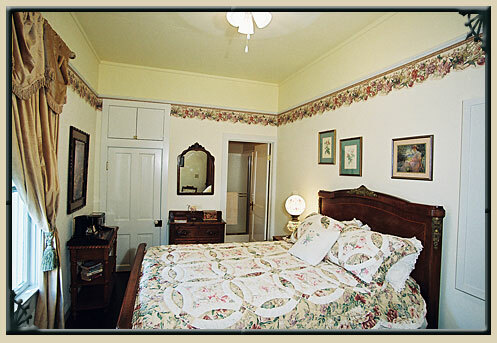 It is furnished with two twin beds, heated with an electric stove that looks like a Victorian coal-burning parlor stove. Brown Bear is a small, pleasant room, and a good value. Price range - $125-$160/night double occupancy. 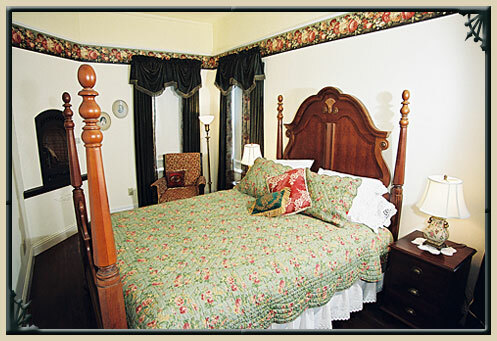 Room 6 "Golden Jubilee" is a long, narrow room furnished with a queen sized four poster bed with a view of the gas log fireplace. It also has a claw footed "champagne tub. This room is the sunniest and quietest room in the house, located at the back of the hotel. It's restful green and floral ambiance makes it one of my favorites. Price range - $145-$220/night based on double occupancy. 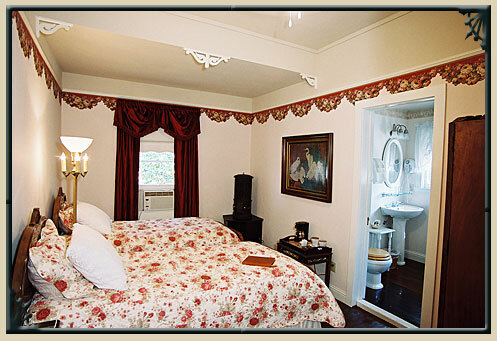 Room 7 "China Bar" has an antique double bed, comfortable chair and is heated with an electric stove that looks like a coal burning Victorian parlor stove. The bed is high enough you may need to use the bed stool to get into it if you are a short as I am. This room is small, the only one without a tub, but friends and family who have stayed in it have been delighted. 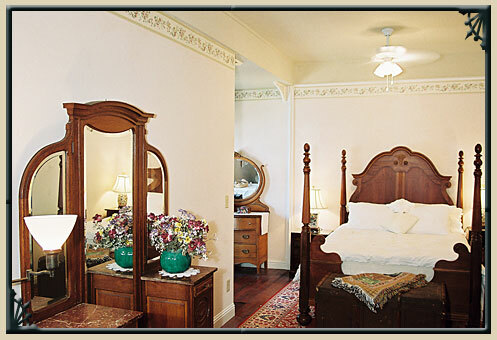 Price range - $110-$140/night double occupancy.